Are there any problems that are unique to the ‘Holocaust’? Asking this question in a revisionist periodical seems to be a bad joke. But when mainstream scholars use this question as the title for a collection of essays, hope arises that finally they might understand that there are some unique problems with the ‘Holocaust,’ indeed. To cut this review short: no, they don’t get it. 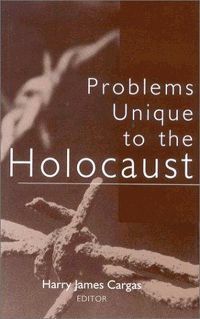 Rather than addressing any of the real problems of the ‘Holocaust’ – lack of physical and documentary evidence, evidence refuting or contradicting many claims, unreliability, false, and contradictory witness accounts, suppression of research, researchers, and research results, monopolization of the entire dispute – all the fourteen authors can do is to philosophize over moral dilemmas allegedly experienced by ‘Holocaust survivors’ who might have made arrangements with their suppressors and ‘Holocaust’ perpetrators in order to survive, or who made other morally ambiguous decisions. "Can Betrayal Ever Be Legitimate? ", "The Moral Dilemma of Motherhood in the Nazi Death Camps", "Holocaust Victims of Privilege", "Suicides or Murders? ", "Holocaust Suicides", "Indifferent Accomplices", "Reflections of Post-Holocaust Ethics"… This excerpt of headlines of some of the papers presented in this volume indicates that moral navel gazing of ‘Holocaust victims’ and their fan community is the main focus of this book. "This murderous German nation! That [killing pregnant Jewish women] was their chief joy!" This quotation goes uncommented, leaving a stench of anti-Germanism in the air. The only headline which raised hopes to address a real problem – "Is Objectivity Morally Defensible in Discussing the Holocaust?" by Robert S. Frey – is also a disappointment. I wrongly hoped to find questions like ‘Is it morally defensible to discuss victim numbers, murder methods, exact circumstances of suffering, credibility of witness accounts, etc. ?’ What Frey does discuss in his essay is merely the question if medical experiments with involuntary human guinea pigs should be permissible. Since I cannot imagine anybody answering this with yes, I wonder why this needs to be discussed in the first place. Isn’t that fantastic? They claim moral superiority due to the fact that they guarantee a discourse with ‘survivors,’ only to take this moral superiority then as a justification to deny the same discourse with those harboring dissenting views, as "fair hearing" is just another word for discourse. What an academic prostitute! Hence, this book is nothing more than another superfluous waste paper product churned out by screwed-up minds of the Holocaust Industry. A perfect waste of time, money, resources, and energy. Source: The Revisionist 1(4) (2003), pp. 474f.